This guest blog comes from Bhavana Singh, who used to be my cubemate at work. We bonded over a shared love for palaak paneer, naan and intense sarcasm, so even though I have moved to another part of the office, we still exchange niceties.. and I'm so nice she has learned how to abuse me for free food. If you remember my potato lunch post, yes - that was cheapskate Bhavana snatching up my potato. Today, she shares her tips on how to scam your friends (or me) into feeding you for free. (And yeah, I have no clue what Recession tips 1-735 are, so don't ask me. She's clearly holding out, that wench). Here’s Recession Tip #736. For maximum efficacy, don’t skip any steps. Step 1 - Plan a vice-filled weekend. Exhaust yourself completely. This will weaken your defenses and ensure that you get whatever bug is floating around town. Step 2 - After you get said bug, lie in bed and whine that you’re sick. Note: Whining must only be done to super-sympathetic friend (SSF) or this whole exercise is pointless. Step 3 – Show up to work looking wan. Your whining should have induced SSF above to get you a generous serving of homemade Rosemary Chicken, Escarole and Bean Soup. Free lunch, hello! If Step 3 hasn’t happened, you’ve done something wrong. Go back to the beginning and try again. You may need to use a different SSF. 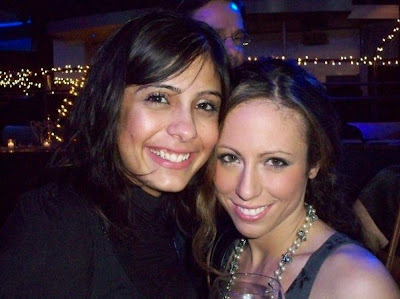 Bhavana and me at a party, enjoying free alcohol.